By now you've probably heard the term affiliate marketing and know a few big names that have made a career for themselves. 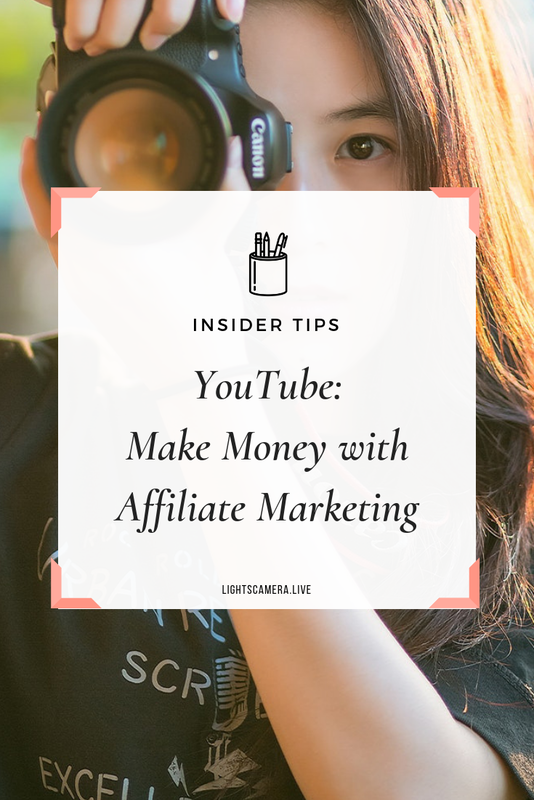 But if you're just starting out, can you really make money online with YouTube affiliate marketing? A lot of people who think about becoming an affiliate marketer get discouraged almost immediately, I know I did. When you're just starting out, it seems like the opportunity to dive into affiliate marketing already passed or that the market is oversaturated. But is it really too late to start? According to Sean Cannell, best-selling author and creator of Video Ranking Academy, it's never too late to start. At this year's VidSummit conference, Cannell led a session on Advanced Affiliate Marketing Strategies to a packed room of YouTube content creators and although, I wasn't there in person, I did watch the live stream. And today, I'm going to share my notes with you so let's dive right in. Cannell recommends joining the Amazon Associates Program where you can join for free. Bloggers and YouTubers who are Associates can create links and when customers click through those links and buy products off of Amazon, they earn referral fees. Just think of how often you buy things on Amazon. I feel like Amazon is delivering packages to our house every other day! As an Associate, you can provide customers the convenience of referring them to a trusted site where they can immediately purchase the products you advertise on your site. And when they do, you can earn up to 10% in referral fees. I have been an Amazon Associates for years and it's helped generate passive income for me because viewers of Lights, Camera, Live would always ask what kind of live streaming gear I have. To make things easier for myself, I joined Kit.com and created multiple listings that I could easily share on social. The really cool thing about being an Amazon Associates is that if someone were to click on your affiliate link, any purchase he/she makes within a 24-hour period could be credited to you. Can I still do affiliate marketing if I have an international audience? If you have an international audience, Cannell recommended signing up for OneLink, a script-based solution that allows you to monetize your international traffic from the United Kingdom, Canada, Italy, France, Spain, Germany, and Japan. When visitors on your web pages click on a text link to buy a product on Amazon, OneLink will redirect your international visitors to their local or nearest Amazon marketplace as this is where they have an account, can see pricing in their local currency and have reasonable, if not free shipping costs. OneLink allows for the best user experience by creating a seamless redirect for your international visitors, allowing them the ability to complete their purchases within their local or nearest Amazon store. This leads to a better shopping experience for your customers, and better conversion rates for you. Cannell also mentioned the Amazon Influencer Program where you really don't need a website or blog to create a storefront - it's specifically designed for social media influencers that have a large following. So if you're a YouTuber or a live streamer and want to promote your gear, you can easily create a storefront and direct traffic there to earn commissions. What’s the difference between the Amazon Influencer and Amazon Associates Program? The difference between the Amazon Influencer and Amazon Associates program is that instead of you sharing a link to a single product as an Associate, you have a storefront that you can direct your followers to as part of the Influencer program. Since I already have Kit.com with product descriptions explaining why I recommend specific live streaming gear, I copied that and pasted it into my Amazon Influencer Storefront list for Panasonic GH5 Live Streaming Gear. Once you have items listed in your storefront, you can then share the link to your audience. (Note: I'm still working on getting a vanity URL). Cannell recommended creating trackable links that you can share in your YouTube descriptions, podcast show notes, email newsletters - pretty much anywhere you plan on linking to your storefront. As a Facebook Live streamer, I've actually made it a habit to include a link to my Live Streaming Gear Essentials in my videos. I also created a Facebook Product Catalog with links to my affiliates. This allows me to tag products in a Facebook Live broadcast and the product will appear at the bottom of my broadcast so viewers can click on them. In the image above, you can see my affiliate link to Group Funnels, a quick and easy way to automate your Facebook Group member on boarding so you can get more leads. To really succeed with affiliate marketing and scale your income faster, Cannell offered 10 YouTube affiliate marketing pro tips. Tip #1. Share products that you're passionate about. "I think integrity is everything. I think legacy is everything. I think if you're ever making short-term decisions or decisions just about money first, you're going to lose in the long term," Cannell said. "When you share products that you love and you use and you're passionate about, then ultimately you can also build your brand, build trust with people, build your reputation, and make money in the process." One of the many things that Cannell is known for is his passion for video production. In fact, he has multiple YouTube channels highlighting his passion and as a result, he's built multiple successful brands online including seanTHiNKs, THiNK International, THiNK Media TV, and Clearvision Media, to over 350,000 subscribers with over 10 million video views. Side note: Cannell is also the reason why I upgraded my DSLR from a Canon Rebel T6i to a Panasonic GH5. I can't tell you how many compliments I get on the video quality of Lights, Camera, Live. With so many other live streamers out there, I wanted to place my show in a league of its own and Cannell's videos helped me do just that. There are A TON of affiliate programs available, some are more lucrative than others but don't sell out and promote products that don't align with your brand. If you just chase the money, it's going to be really hard to convince your audience and for you to actually make a sale. Cannell has done tons of product reviews related to tech because it aligns with his brand of sharing tips and video strategies for increasing one's influence, income, and impact with online video. "If you want to make big money with affiliate marketing, you actually need a big market," said Cannell. "At some level, if there's just not enough volume or not enough people that are searching or looking for certain things, then you potentially can't make a major impact." Doing your research before you record is important. You need to find out how much interest there is for your topic or particular product. To do just that, Cannell recommends installing the Keywords Everywhere extension to your Chrome or Firefox Browser. This free tool will tell you the search volume for your targeted keyword and how competitive it is. He also explained to VidSummit attendees the impact of targeting a Product Name versus a Product Category. When you target a specific product by it's name, viewers of that content are already in the consideration phase of the sales funnel. These individuals know exactly what they're looking for. When you create content based on Product Category, that gives you the opportunity to target a broader audience that may be in the awareness phase of their customer journey. Try to create content for both to see which one converts. You want to plan in advance and publish your videos when it's the best time of the year. Cannell shared a story of his "Gift Guide for Him" video that always sees a spike in views during the holidays. He times his content to go along with key events his audience would be interested in like Black Friday, Cyber Monday, and even Amazon Prime Day (another reason to setup your Amazon Influencer Store Front). If you're a fashion blogger, you can plan your content by seasons (e.g., Fall Fashion Must-Haves, Spring New York Fashion Week, etc.). Cannell recommends using Google Trends to research seasonal trends in your industry, keyword search performance by region, and using the related topics and queries feature to brainstorm new ideas for recording videos. After you've identified the tentpole events in your industry, be strategic and time the release of your videos for when search intent is high. In addition, make it a habit to block out your calendar so you can plan and produce your videos. "When we studied Black Friday, we actually learned that November 12th - 18th is when there's a massive rise in search and popularity for the term Black Friday," Cannell explained. "Even though Black Friday is November 26th - as early as about 10 days or more before - people start getting interested in it. You can start reverse engineering and planning out the time of your uploads based on tentpoles." All you have to do is type in any term in Google Trends to strategically position your YouTube content for affiliate marketing. Cannell also suggested maximizing on trends in your industry. Every year, Cannell covers both the Consumer Electronics Show (CES) and the National Association of Broadcasters (NAB) Show in Las Vegas because it aligns with his channels. Plus, not only are the people in his target market showing up for these events, they're also searching for new announcements online. Another pro tip from Cannell is to research a product's affiliate marketing commission. Some programs may only offer 4% to 10% commission while software programs can offer anywhere from 30% to 50%. Ask yourself how much the product actually costs and how much commission you'd get in return for one sale. Is it worth the time and effort? Cannell shared a case study for one of his students named Timothy that is passionate about drones. Timothy creates product review videos of drones and to date, he's earned more than $20K as a DJI affiliate. "If you do high-volume and it's a two dollar lipstick you might not earn that much but if you go higher ticket you can get also higher commissions," explained Cannell. What are the problems and questions your target audience is currently trying to solve? "What is it they're looking for?" asked Cannell. "You start putting out videos on the other side of those questions related to affiliate marketing - you can crush it." When creating content strategically for affiliate marketing, continue to add more value and upload your videos strategically to make more money. Cannell recommends that YouTubers reverse engineer their niche audience to understand audience intent. Overall, if you want to scale and make more money with YouTube affiliate marketing, you need to drive more traffic and views. And to do that, you'll need Sean Cannell's free "17 YouTube Quick Tips Checklist."